Moonset and Pigeon Point, originally uploaded by dmzajac2004-. 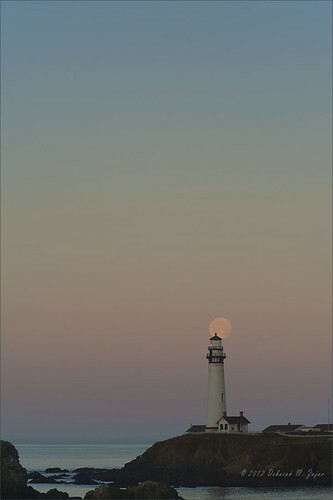 I had hoped to line up the moon behind the lighthouse this morning, but I botched the alignment of this shot. I hope the next time I try it the sky is as clear as today, and I do a better job of aligning myself and the lighthouse. I have to say even though I botched the alinement I love the the sky. The layers of color were lovey and the soft pink luster the Belt of Venus lent the morning was a gift. It made up for my bad calculation. I think there will be some of you who think I should crop the top of the sky, but I love the graduated layers of color so I’ve left it as I saw it.